On Wednesday, November 12, a group of Humanitarian Support Foundation employees volunteered their time and effort at Medshare in Decatur in order to help get medical supplies to areas of the world where they are scarce and much needed. The evening started with an overview of what Medshare does and how they make an impact on a global scale. Medshare gathers new, unused, excess medical supplies from both hospitals and manufacturers. These supplies are sorted and inventoried, and different organizations in need of them (hospitals, hospices, etc) are able to select exactly what they need through an online system. The requested supplies are then sent to the area in need (Humanitarian Support Foundation gladly helps with the logistics of sending the supplies). This system is what makes Medshare stand in contrast to other similar programs as it minimizes waste by sending specifically what is asked for. Most of the organizations who take advantage of Medshare’s inventory are in areas of the world where having medical supplies can be the difference between life and death; a story was told of a man losing both his wife and newborn child due to the doctor in his local village not having the medical supplies needed to help them both through labor. After this sobering tale, all the volunteers at Medshare were eager to get started and contribute to this significant cause. The evening consisted of volunteers taking boxes off of a central set of pallets and sorting the supplies within them by type and size. Supplies included gloves, masks, syringes, and gowns amongst other items. If the original boxes were damaged, the items were repackaged in new boxes and labelled appropriately. If there weren’t enough of one item to fit in a box, it would be put aside until more of those items were found to fill the box. 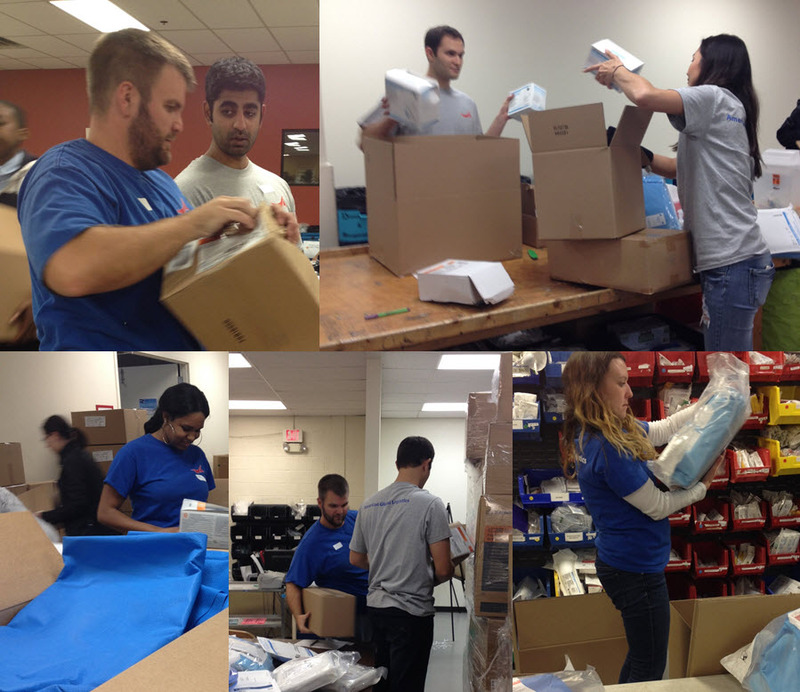 As the night progressed, everyone worked more and more efficiently and boxes were being filled quicker and quicker. By the time all was said and done, the majority of the boxes were sorted. Excess items were put back on the pallets for the next set of volunteers to work with. Alvaro, our supervisor, told the volunteers that 237 boxes and 1,100 pounds of supplies were sorted. Though the work might sound monotonous, it was both meaningful and enjoyable due to the company of fellow volunteers and the spirit of giving back. It was also crucial work- Medshare’s online selection and inventory system couldn’t function as it does without it. At the end of the night, the volunteers were told that the supplies they sorted would be sent to Cote D’Ivoire, Sierra Leone, and other areas of West Africa. Knowing exactly where the supplies would be going gave the volunteers a true sense of the impact they made during their three hours there. The night wrapped up with the sorting area being cleaned in order for it to be presentable for the first lady of Honduras who was going to be visiting the next day. Alvaro expressed his deepest gratitude to all the volunteers, and he made sure that Humanitarian Support Foundation was given a round of applause for their role in helping with the logistics of getting Medshare containers overseas. The night was a rousing success, and Humanitarian Support Foundation looks forward to partnering with Medshare in the future. 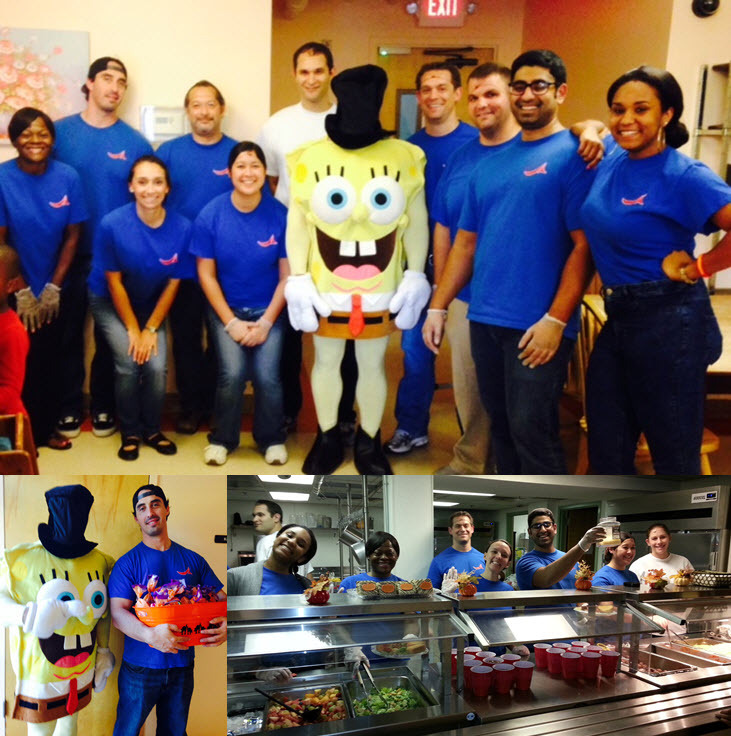 On Thursday October 30th, Global Children’s Humanitarian Foundation (Humanitarian Support Foundation) team members went to the Genesis Shelter, to serve up scary scrumptious food and pass out some terrifyingly tasty treats to the residents and their young children as a part of a Halloween feast. We also dropped off all items we collected in our October month long drive that we held at our building. We collected items such as diapers, formula, sheets, baby wipes, hygiene products, etc. Humanitarian Support Foundation team members served residents spaghetti and meatballs, garlic bread, Caesar salad, fruit salad and cookies in addition to handing out bags of treats to all the children. While all the team members helped make this evening enjoyable, one team member shone brightest with the shelter residence. Children and adults alike were enamored with Taylor Littlefield, possibly for his endearing personality, but more likely due to his SpongeBob SquarePants costume. Taylor endured kicks and punches to the costume, held babies, and posed for dozens of photos while bringing smiles to lots of faces at the shelter. A special thank you to Taylor for your enthusiasm and effort and to all the people that donated in the October drive. The Genesis Shelter was beyond excited with all the items we brought for them. Humanitarian Support Foundation has been volunteering at the Genesis Shelter for several years now and supports the Genesis shelter and its mission with time, funds and odds to make the lives of its residents a little bit easier. As it has been every time, this was an overwhelmingly positive experience for all involved and team members are already talking about when we can get back to the shelter to volunteer again. 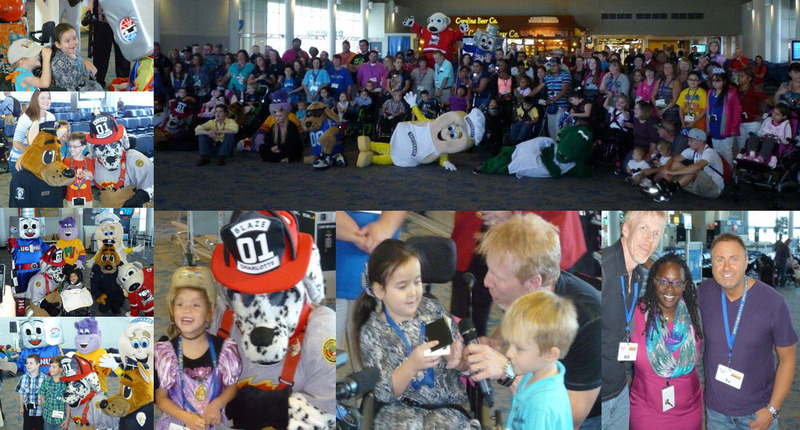 On October 8, 2014, Humanitarian Support Foundation Charlotte Office, was invited to attend and volunteer at Charlotte Douglas International Airport with the children and families that were selected to go on their 1 week trip to Disney World. Humanitarian Support Foundation has been a proud sponsor for this Charlotte based Charitable Organization, Ace & TJ’s Grin Kids for the past 2 years. This wonderful organization pays the way for terminally ill children to experience a once in a lifetime 1 week trip, all expenses paid, to Disney World in Orlando, FL. This year over $ 125,000 were raised which will allow for several children and their families, over 150 individuals, to experience this opportunity. On Friday, October 10, 2014 and Saturday, October 11, 2014 Humanitarian Support Foundation employees participated in Reptile Day at the Virginia Museum of Natural History in Martinsville, Virginia. Reptile Day was an exhibit that consisted of different species of turtles, snakes and lizards, among others. Student Day, Friday, welcomed over 300 students from area schools. Students were able to learn about the different species, as well as, their natural habitats. Saturday was open to the public and welcomed more than 1,300 visitors from several states including Virginia, Arkansas, Georgia, North Carolina and South Carolina.